T Cups LA Creates Custom Cups And More! Youʼre supposed to be hydrating here in California anyway…why not do it and show off your personal style at the same time? Cheer Mom? Firefighter Wife? Court Reporter? Sports fanatic? Or maybe, you are a fan of the grape! We have your cup or wine decanter set, with your support logo and your name to further personalize the drinkability of your mug. Finally – gifts for that special occasion that you can afford! 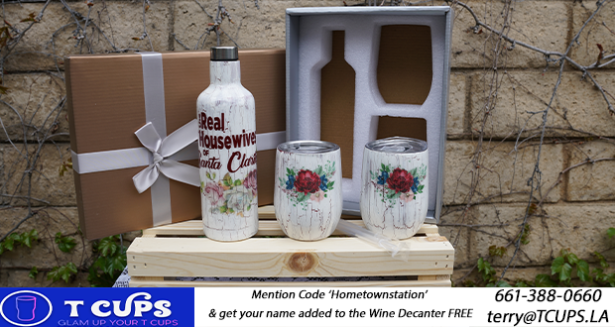 For a limited time, when you order a wine decanter set and mention code ‘Hometown Stationʼ, we will add your Family name to the decanter FOR FREE. While the standard set includes a wine decanter and two wine tumblers – one for both you and your SWP (Significant Wine Partner), more can be added to grow the set. Inquire and learn more about this limited edition! For more information about T Cups LA, click here.